For a successful stay, facing the sea in a comfortable studio and many household equipment. 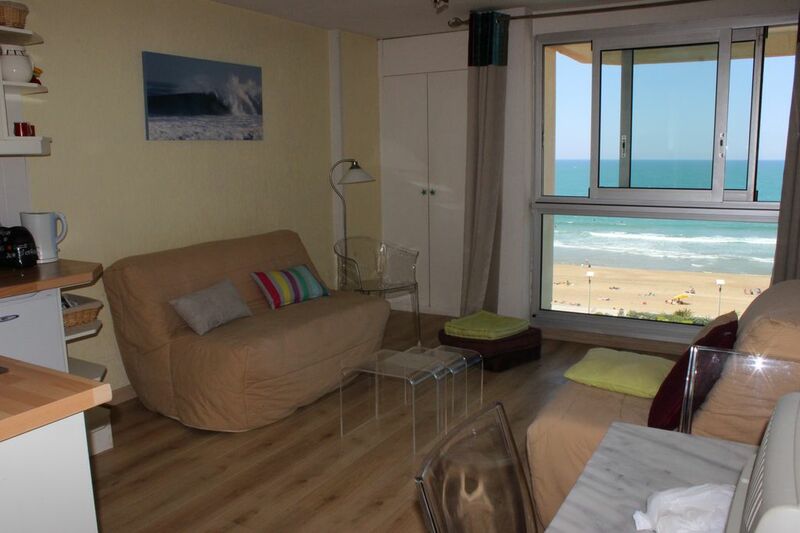 BIARRITZ - STUDIO COMFORTABLE AND WELL MAINTAINED. FACING THE OCEAN, on the Grande Plage of Biarritz, you will enjoy a wonderful view: the suns sunsets are particularly spectacular. - In the heart of the imperial area, (the most sought Biarritz), all feet amenities: shops, restaurants, cinema, casino. You will enjoy the city center of services (Halls 10 minutes walk), its modernity, in a beautiful setting, within the architectural and historical treasures of Biarritz. Comfortable and well equipped, our studio offers sleeping space for three people. Free access to the pool (refurbished) from the residence (15 June to 15 September). Possibility to rent linen (surcharge optional). No surprises: the photos, recent, are the reality of our rental. (Sea view, planning). Cozy, welcoming and well maintained, our studio will contribute to the success of your stay in the Basque Country! Rentals are from Saturday to Saturday. For any other request, thank you to contact me by phone. Possibility of reserving a parking space, optional. (Casino parking, located about 100 meters from the residence, it is clean and secure, kept 24/24). Tourist tax: 0, 50 euro per person per night. To be paid upon arrival, it is obligatory and fully paid to the Town Hall. A deposit of 360 euros will be required at the entrance of the place, it will not be cashed and returned if no damage is found. Bathroom with bath, toilet are independent. A comprehensive quality electrical appliances (dishwasher, microwave grill, toaster, coffee maker, food processor ...). There are also television. We had a wonderful experience staying at the property. Everything exceeded our expectations, including the wonderful welcome and assistance. The property is well furnished and all of the items needed for self catering were provided. All of the furnishings and finishes were sympathetic to the sea-side surrounds. We liked the security of the building and the fabulous views and sounds of the ocean. Madame Cornelius has put considerable effort into making this property a desirable place to stay and to return to. Biarittz is an ideal place to base yourself for visits to nearby St Jean de Luz, Bayonne, St Sebastian and other beautiful towns nearby. No car is needed thanks to the wonderful French bus and railway systems. There is no shortage of good food, friendly people and endless walks along the sea-side. Take some time to go to the bars after 5pm and experience the social nature of the wonderful local people. We recommend this property highly to those who wish to do some self catering and also indulge in the delights of the local gastranomy. Daily visits to Les Halles near La Poste are mandatory for your fresh food needs and to experience some delightful tastes of the region's specialities. Nous étions très bien placés face à la mer, près de la ville, près de la piscine et de la mer. C'était royal. Nous avons passé un très bon séjour. Très belle vue, appartement bien équipé et place de parking à disposition pour encore plus de confort ! Locataires très agréables. Nous les accueillerons à nouveau avec plaisir. L'appartement est très bien situé, face à la mer. Vue sur le coucher de soleil tous les soirs ! Et BZ très facile à plier. La propriétaire est à l'écoute et disponible. Locataires sans problème et très agréables. Je les recevrai à nouveau avec grand plaisir. Sea at the foot of the building. You are in front Sea !!! You get a panoramic view of the Great Beach of Biarritz, the rock of the Virgin at the Lighthouse. La taxe de séjour d'un montant de 0, 50 euros par personne (adulte) et par nuit sera demandée aux locataires.Elle est intégralement reversée à la Mairie.